The Toddler 1 students were delighted to return to their classroom and friends after Spring break. Some children were quick to seek out new materials on the shelves, while others were excited to get their hands on some favorite pieces of work. Several Toddler 1 students have been working on new animal family jigsaw puzzles. 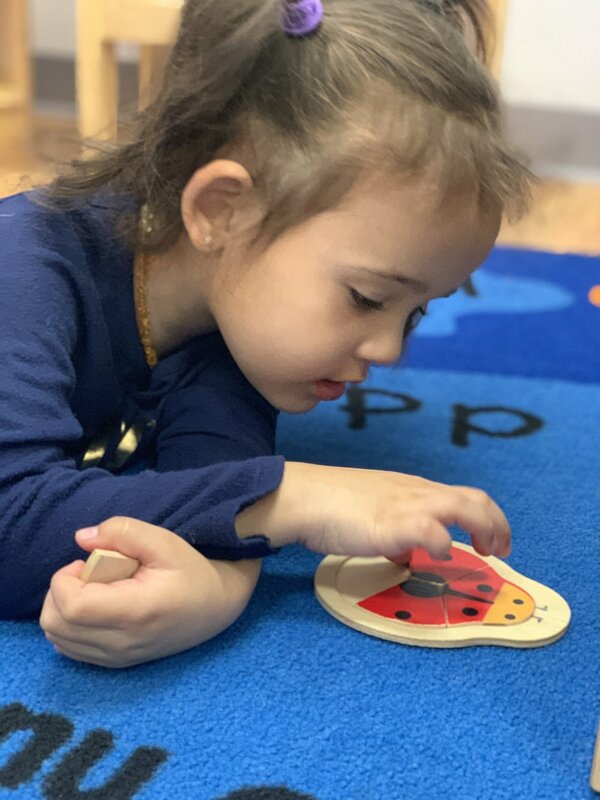 In addition to figuring out the challenge of the pattern of the pieces without the aid of a frame or matching picture to guide them, the children must sort the pieces first to see which set of animals they belong to. Though it requires quite a bit of patience and persistence, the children are often so pleased with themselves for completing the puzzle that they want to take it apart and start the process all over again. Another popular new puzzle in the Toddler 1 classroom is used to support the concept of associating number symbols with their corresponding quantities. After carefully counting each picture on a wooden block, the students search for the corresponding numeral to see if it fits. Because this material is self-correcting, the children can independently realize if they have made a mistake, fix it and move on without needing any assistance from an adult.